My daughter has a February birthday, but despite my hints she was always uninterested in having a Valentine-themed party. (I admit, I was motivated less by a love for V-Day than laziness: so easy to find appropriate party accessories!) Apparently age 7 was the sweet spot, though, because this year she finally asked for a hearts-and-love bash. Yes! I like to keep parties simple–snacks, a craft activity, cake, done. For the craft, my first thought was to decorate crowns (Queens of Hearts! 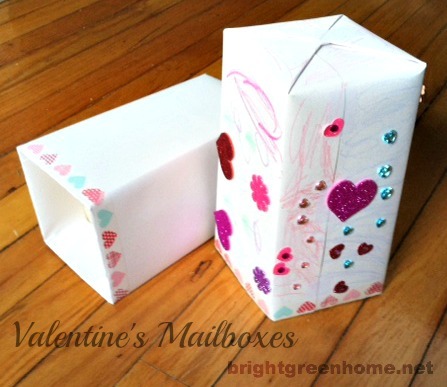 ), but R had her own idea: She wanted everyone to make Valentine mailboxes, and then they would make valentines for each other, and hide the mailboxes, and…something complicated. Decorating mailboxes, though, I could make that happen. I could have bought a kit of precut mailboxes online, but then I looked at my recycling bin and realized I had the raw materials on hand: milk cartons. I have a toddler with a big appetite, so it only took about two weeks to accumulate 10 half-gallon milk cartons–creative reuse FTW! There are lots of tutorials and Pinterest images for milk carton mailboxes, but in the end I decided to make my own life as easy as possible. I cut off the tops of the cartons, thoroughly washed and air-dried them, then covered them with plain white construction paper (stuck on with regular clear tape) and added a washi tape border around the edge just to fancy them up a bit. No lids or fancy shapes, and the paper-and-tape part was something I could do mindlessly while sitting in front of the TV one night. At the party, I let the kids have at it with crayons and stickers. They were so absorbed in decorating the mailboxes that I totally forgot about the valentine-making component of the activity, but no one seemed to mind. 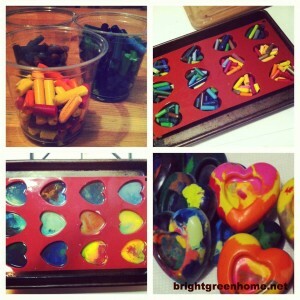 For the goody bags, we made heart-shaped crayons, using up all the sad broken loose crayons rattling around R’s bedroom. I peeled the paper off the crayons, broke them into smaller chunks, and grouped by color family to satisfy my own OCD needs, and R filled the molds (we used a silicone heart-shaped cake/candy pan I bought especially for this purpose–the crayons leave a wax film on the pan that won’t wash off, so you can’t reuse the pan for food) with different color combinations. In the oven on the lowest heat setting until everything melted–I actually left them in a little longer than necessary (forgot they were in there while we were eating dinner! ), but no harm done other than our kitchen stinking of melted crayon until the next morning. So easy and they turned out great!